Science fiction is a form of fiction that includes some form of speculation as to a possible scientific discovery, invention, or project that has not yet come to pass at the time of writing. A speculative project may, but does not necessarily, violate the laws of nature as most scientists understand them. A speculative discovery may be either a new scientific law, or a revision of an existing law, or of an object, substance, environment, or even an entire civilization previously unknown to man. 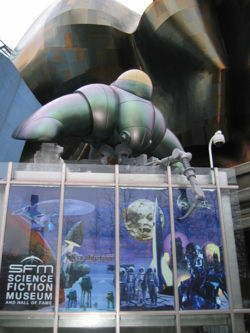 Most science fiction works incorporate evolution. Modern science fiction as most people understand it today began with the novel Frankenstein, or the Modern Prometheus by Mary Shelley, with various works by Nathaniel Hawthorne and Edgar Allen Poe, and with the novel The Strange Case of Doctor Jekyll and Mister Hyde by Robert Louis Stevenson. These works mainly were warnings to a brash mankind that some avenues of scientific investigation would be better left unexplored. The projects resulting from them, however much good they might promise, inevitably bring harm upon the investigator, those closest to him, and any number of innocent bystanders. This applies even to Jules Verne and his works (such as Twenty Thousand Leagues Under the Sea and From the Earth to the Moon), because the heroes in them almost always come to sad ends. Toward the end of the nineteenth century, Herbert George Wells and Edgar Rice Burroughs sounded similar dark themes in their work. But their warnings were less about someone investigating something he shouldn't and more about possible dire futures for human civilization and the planet itself. Wells' The Time Machine is the best illustration of this concept. The twentieth century saw science fiction become far less serious in its purpose. The works of Hugo Gernsback and others were intended merely to entertain and amuse--in other words, to help the reader escape an unpleasant reality. But reality would soon reimpose itself on the imaginations of science-fiction writers. The nuclear attack on the Japanese cities of Hiroshima and Nagasaki inspired many writers to create monsters of tremendous size and destructive power comparable to the power of nuclear weapons, and other writers to speculate anew on the harms that can result from playing fast and loose with dangerous new forces--in this case, atomic radiation. The deepening mutual scorn in which the United States of America and the Union of Soviet Socialist Republics held one another, originally inspired works featuring extraterrestrial expeditionary forces coming to the earth to make war upon humanity (or occasionally to catch humanity in the crossfire). Later writers, editors, and producers, like Gene Roddenberry, would speculate that humanity would expand on new voyages of discovery, only to end up fighting with enemies that looked and behaved very similarly to whatever power was foreign to the writer's nation-state of origin. Eventually, however, this theme would give way to hopeful tales of God-substitutes promising to solve all humanity's problems, if humanity's leaders were smart enough not to provoke such people to war. H. G. Wells' work is the best example of prevailing paradigms of scientific consensus influencing science fiction. The meme of evolution was quite strong in Wells' day, and this surely must have informed his projection of the evolution of man and of civilization into the dire picture he painted in his best-known work. The 1950s saw several films that borrowed plot-themes from evolution. Many of them used atavism (the retrogression of a species, or even an individual, to a stage of macroevolution several epochs in the past) as a plot-theme. Although many of these projects more properly belong to the genre called horror (from the Latin horreo I shudder), they all had a strong science-fiction element, using as they did a form of speculation on the progress (or alleged possible regress) of evolution. In that same era, a noted science-fiction author named Larry Niven created a story arc that began millions of years before the present with an apocalyptic war that destroyed every thinking being of the period. Life, presumably, had to re-evolve after that, but artifacts of that war--some of them very dangerous--remained. More recently, science fiction appears to have influenced "real-life" speculation. The Crick and Orgel theory of directed panspermia involves an obvious science-fiction device, namely a brace of interstellar or even intergalactic missiles and an extraterrestrial civilization to build and launch them. Crick and Orgel, in turn, influenced the successors of Gene Roddenberry to tell a story of the contact, on the part of humanity and its allied civilizations, with the very civilization that fired such a brace of missiles at earth and other worlds. The Christian faith is firmly rooted in actual historical events, which are at odds with evolutionary concepts of origins. Thus at first glance, the concept of faith-based science fiction might seem oxymoronic. However, all fiction is at odds with reality to a greater or lesser extent. A writer may choose to limit his speculations strictly to those for which a Scriptural warrant exists, and to create characters whose faith informs their decisions and actions. A writer might also project his characters into a world that the Bible or creation science might predict, and evolutionary "science" might declare impossible. Some science fiction by Christians presents an allegorical universe with substitutes for Biblical figures. Plot-themes of recent faith-based science-fiction works have involved time travel, either real or virtual, to past human environments, for example to Jerusalem before its destruction by a Roman general or even to the civilization that might have existed shortly before the Global Flood. Eschatology is possibly the most frequent theme in Christian science fiction today. Neither has the Christian faith been the only faith to have science fiction based upon it. Television producer Glen A. Larson, in 1978, developed a short-lived series suggested by key tenets of his own Mormon faith. Beyond these examples, a science-fiction writer might create an entirely artificial religious system and set stories in it. This raises the question of where science fiction ends and the larger category of speculative fiction, that might or might not include the treatment of a scientific invention or development, begins. ↑ Ingermanson, Randall Scott. The City of God Series, including Transgression, Premonition, and Retribution. Published by Bethany House Publishers in 2000, 2003, and 2004. These works depict a renegade time traveler bent on killing Saint Paul. ↑ Deardon, Amy. A Lever Long Enough. Glenville, MD: Taegais Publishing, 2009. A team of military time scouts attempts to travel to Jerusalem to witness and record the alleged theft of the body of Christ from His tomb. ↑ Johnson, Shane. Ice: The Greatest Truths Lie in the Darkest Shadows. Waterbrook Press, 2002. Two American astronauts, stranded on the moon, take refuge in an antediluvian moon base, and one of them accidentally propels himself, or so he believes, to antediluvian earth shortly before the Flood. ↑ See, for example, LaHaye, Timothy, and Jenkins, Jerry B. Left Behind: a Series of the Earth's Last Days. Published by Tyndale House Publishers from 1995 to the present. ↑ Lorenzen, Michael. "Battlestar Galactica and Mormonism. Publised on-line 2002. Accessed January 7, 2008. ↑ Leventry, Ellen. "Born again 'Battlestar': The Theology of 'Battlestar Galactica'." <http://www.beliefnet.com>. Accessed January 7, 2008. ↑ Editor unknown. "James McGrath on Religion and Science Fiction: An Interview." TheoFantastique. Accessed January 7, 2008. Firebird: A Trilogy, by Kathy Tyers - What if man had entered the Space Age before Messiah came? This page was last modified on 19 January 2014, at 00:15.